Copyright 2016 Australasian Evaluation Society Ltd. 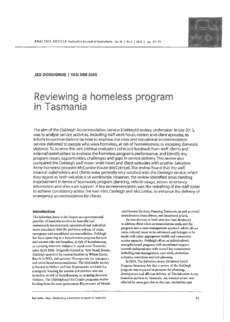 The aim of the Oaklelgh Accommodation Service (Oakleigh) review, undertaken in late 2013, was to analyse service activities, Including staff work hours, rosters and client episodes, to inform recommendations on how to improve the crisis and transitional accommodation service delivered to people who were homeless, at risk of homelessness, or escaping domestic violence. To achieve this aim Internal evaluators collected feedback from staff, clients and external stakeholders to evaluate the homeless program's performance, and identify any program issues, opportunities, challenges and gaps In service delivery. This review also compared the Oaklelgh staff roster, work hours and client episodes with another Salvation Army homeless program McCombe House (McCombe). The review found that the staff, external stakeholders and clients were generally very satisfied with the Oakleigh service, which they regard as both valuable and worthwhile. However, the review Identified areas needing Improvement in terms of teamwork, program planning, vehicle usage, access to tenancy information and after-care support. A key recommendation was the redrafting of the staff roster to achieve consistency across the two sites, Oakleigh and McCombe, to enhance the delivery of emergency accommodation for clients.